This post is in partnership with Worldcrunch, a new global news site that translates stories of note in foreign languages into English. The article below was originally published in the leading French daily Le Monde. Despite the end of the 48-year state of emergency, signed this week by President Bashar al-Assad, protests were continuing Friday. It is just one more outward sign of the sinking faith in the regime's durability. Decrees are signed, but "security forces don't obey the law," says one Syrian commentator on the Internet. Indeed, some now believe that inside the regime, the President isn't as powerful as he might seem. One activist said: "We wonder who really makes decisions in this country." Assad's ability to govern has been questioned from the outset, in 2000 when he replaced his father as President of Syria. Critics wondered how the then inexperienced 34-year-old could lead a regime where many didn't want him as leader. More than 10 years later, however, he seemed to have proven his authority to the point were political analysts thought that he would avoid the wave of Arab uprisings sweeping the region's dictators. Unlike his former Tunisian and Egyptian counterparts, Assad is seen as a zaim, or Arab leader, because of his openly anti-Israeli and anti-American stance. His popularity was bolstered by an all-powerful system of coercion and the work of the country's intelligence services. However, since February, there have been several contradictory statements and rumors of rivalry within the Assad clan, which have revived the idea that the regime is facing internal struggles. "These divisions are real," says a Syrian businessman who has met Assad several times. "The President and his wife Asma are reformers but they don't make all the decisions. Bashar al-Assad is torn between his family's interests  his brother, his sister and his uncles have considerable influence  and his duty towards his country." Relationships have always been troubled among the Assad children. The eldest, Bushra, is said to be influential and authoritative. Her relationship with Asma is strained. She accuses her sister-in-law of being too present in the media. Her youngest brother Maher shot her husband Assef Shawkat in the stomach in 1999 in the middle of the presidential palace. 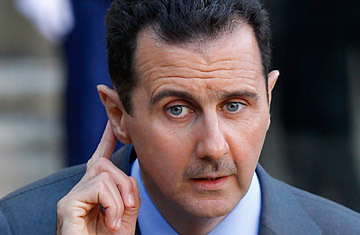 Despite Maher's warnings, Bashar made Shawkat a close ally by putting him in charge of the army's intelligence services. In late 2008, they had a falling out with rumors of an attempted coup. But Shawkat has reportedly since been forgiven. Maher also claimed his stake inside the clan, giving the President a much needed though sometimes intrusive support. He is the real "leader" of the army, applying pressure on all policy issues  even foreign affairs  and is thought to be more of a hard-liner than his brother, and is said to be hot-tempered. For critics, he personifies the regime's brutality.